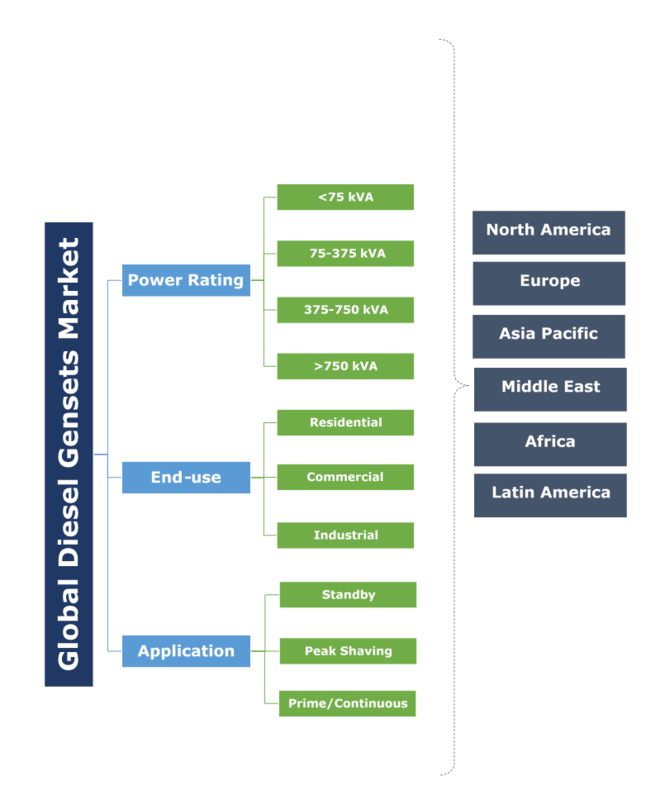 Global Diesel Gensets Market size was valued over USD 13 billion in 2018 and is set to expand over 6% by 2025. Rising demand for consistent and reliable power supply primarily driven by increasing penetration of critical electronic load will boost the global market growth. Furthermore, growing consumer awareness toward emergency backup power solutions as a countermeasure toward increasing frequency and intensity of grid disruptions will encourage the product adoption in coming years. According to the U.S. Energy Information Administration (EIA), electric power outages in the U.S. nearly doubled between 2016 and 2017, owing majorly to adverse weather conditions. Global diesel gensets market will witness robust growth on account of growing commercial centers and large infrastructures driven by resurgent economic growth and urbanization. Limited grid connectivity along with high electricity rates across some of the developing nations will further propel the industry growth. According to the World Bank, countries including Angola, Chad, Mali, Mozambique, Sudan, Uganda and Zimbabwe had electricity access to less than 50% of their population in 2016. <75 kVA diesel gensets market is anticipated to grow on account of increasing frequency of natural disasters, power failures and aging grid infrastructure. Shifting trends toward lower power segment of generators, ideal for residential applications owing to their techno-economic viability will further enhance the business growth. Additionally, increasing consumer awareness toward reliable and affordable backup power solutions will escalate the deployment of these units to a wider spectrum of users. 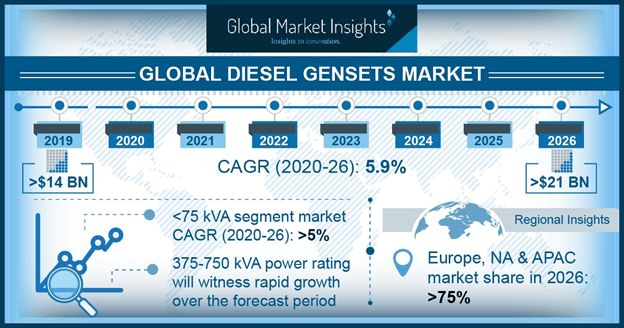 >750 kVA diesel gensets market is poised to gain an appreciable growth on account of the surging demand from businesses, large retail units, data centers, and light industrial sector. Growing demand from data centers owing to burgeoning number of smartphone and internet users will significantly boost the penetration of these units across the business landscape. Moreover, escalating costs of data centers outages and downtimes will further accelerate the wide-scale commercialization and deployment of these units. Residential diesel gensets market is predicted to expand over 6% by 2025. Growing significance of emergency backup power as preparedness measures against frequent grid disruptions will propel the adoption of these units. Inadequate grid infrastructure and unreliable power supply along with growing demand for reliable power will further boost the product deployment. According to the world bank, India suffered a loss of over USD 80 billion in 2016, owing to power sector distortions. Ongoing investments toward development of commercial centers along with growing urbanization will stimulate the commercial diesel gensets market growth. Rapid expansion of data centers across the globe, owing to growing number of internet users will further boost the industry growth. According to an estimate, data centers consumed over 400 terawatts of electrical energy in 2017 and is anticipated to double its size by 2020. Prime power diesel gensets market will witness growth on account of burgeoning industrialization and expanding infrastructure, predominantly across the developing countries. Shifting focus of investors toward remotely located oil & gas fields, mines, and construction sites coupled with lack of grid infrastructure at these locations will drive the industry growth. Moreover, growing number critical loads from hospitals and communication stations at off-grid locations will escalate the product deployment. Temporary grid disruptions caused by weather related disasters and inefficiency of electrical infrastructure to endure demand load will stimulate the standby diesel gensets market growth. Intensifying load on the utility supply, increasing severity of weather related outages along with growing consumer awareness toward emergency backup power solutions will positively influence the product penetration across the industry. The U.S. market will witness robust growth on account of increasing vulnerability of the aging grid infrastructure along with rising frequency and severity of natural disasters. For instance, in May 2018, a spring storm in the U.S. left over 370,000 residents without power in New Jersey, New York, Pennsylvania and Connecticut. Similar historic occurrences have substantially amplified the country’s reliance on generator sets as a preparedness measure for future extreme weather conditions. Ongoing proliferation of industrial, commercial, residential, and retail infrastructures will boost the Asia Pacific market growth. Burgeoning telecom sector, rapid industrial growth, and frequent power failures across the region will further drive the business growth. Moreover, large-scale expansion of data centers and digitization across several Southeast Asian countries including Indonesia will further impart an impetus to the industry expansion across the region. Africa market will witness an appreciable growth driven by the inadequacy of utility grids to cater basic power demand along with rapid population growth in the region. For instance, Nigeria accounts for almost three-quarters of the electricity supply provided by the backup generators. Moreover, electricity prices in parts of sub-Saharan Africa are amongst the highest in the world, which further limits the use of regional grid infrastructure, thereby strengthening the demand for these gensets. Notable industry players operating across the global diesel gensets market include Cummins, KOEL, Briggs & Stratton, SDMO, Generac, Honda, Powerica, Escorts Group, Yamaha Motor, Sterling Generators, Himoinsa, Caterpillar, Ingersoll-Rand, Atlas Copco, Ashok Leyland and C&S Electric amongst others. Technological innovations, emissions compliances, cost competitiveness, product differentiation and extended service & distribution network are the vital strategic assets for an industry player to remain competitive in the dynamic industry landscape. A diesel genset (generator set), also known as a DG set may be defined as an electrical equipment comprising a generator, a diesel engine, and other ancillaries, which produce electrical power. The product is primarily deployed to supply emergency power during a grid failure or to provide power in sites where grid access is unavailable. Increasing dependency on electricity and security of supply will foster the product demand across residential, commercial, and industrial applications.